Yono and the Celestial Elephants was exactly the style of game that I needed in this harrowing line of video game review. You see, I partially play video games, as many do, as an escape from the harsh realities of everyday life. Wildfires, a child that doesn't want to eat veggies, war, etc. So, while I have played and reviewed a wide variety of games as of late, I've noticed that many of them have been very intense, skill based, or super challenging. Some were even incredibly ultra- violent (Slain: Back from Hell). 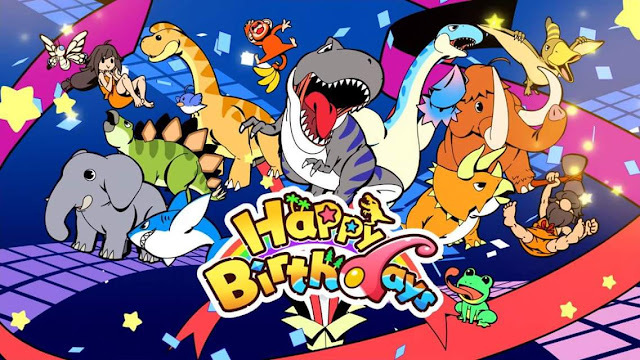 After all of that, I needed a simplistic, colorful world full of fun, and innocent hijinks. 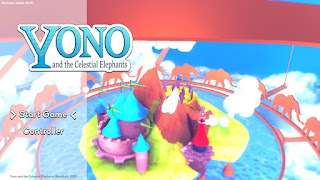 Enter Yono and the Celestial Elephants. In this game, we exist in a world in which Elephants only visit every millenium, and their function in this world seems to be that of entities that help people with their problems to make the world a better place overall. By helping one person, we help everybody, essentially. 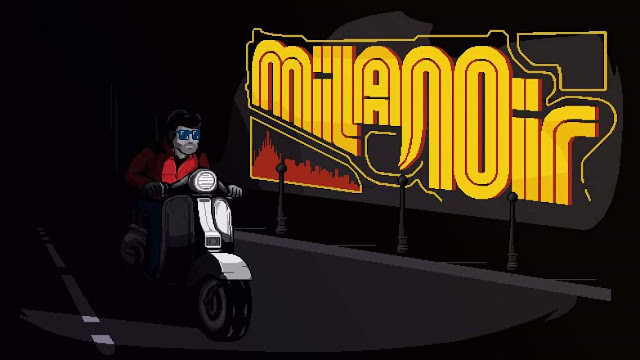 Now, the game does address some more serious themes than you would think based on appearances, but they aren't presented in an oppressive manner. What is interesting about this world, is that we learn there is a city full of sentient robots, and everyone is surprised to see an elephant wandering around the world. The first person that you encounter on your quest, is a young human pirate, and she will act as a pseudo-guide on this journey. She is also a prankster, as many kids tend to be, and we get to see that early on. 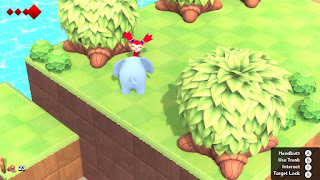 Yono and the Celestial Elephants draws some pretty obvious inspiration from the Legend of Zelda series, but that isn't all this is. 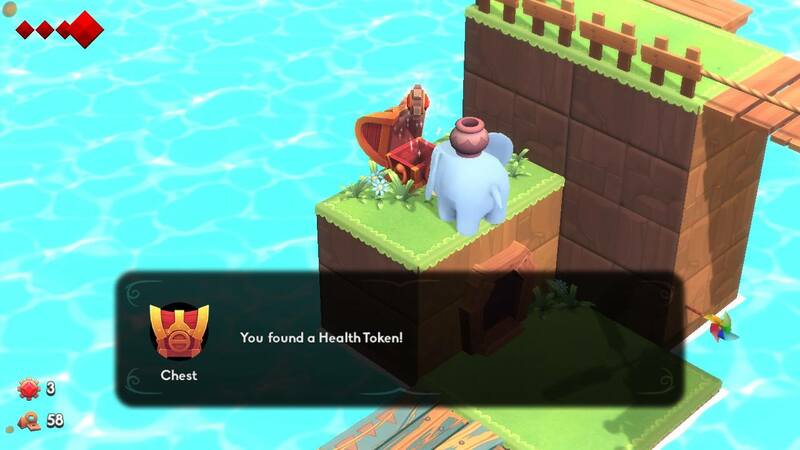 There are health tokens found in chests that act just as heart containers do, and there are puzzles aplenty, but that is basically where the similarities end, for me, at least. It is a much more straight forward game than Zelda, and the puzzles present themselves more frequently and are used as the natural obstacles to reaching your destination. In this way, it feels more like a sokoban- style game to me, and the very bright world makes it a pleasure to watch unfold. The music is laid back, and keeps the atmosphere just right. You interact with the world by utilizing your weight to push around boxes or ramming into rocks/enemies to break/defeat them. 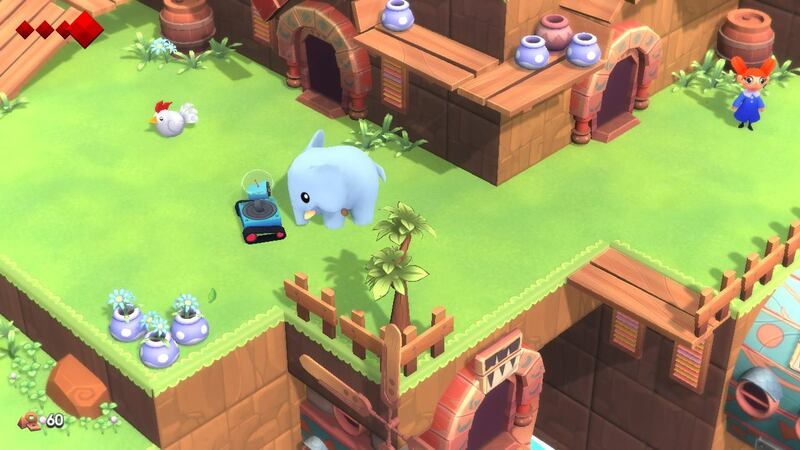 You can also use your trunk to blow air, which will activate pinwheels, knock enemies back, and can be filled with water to spray water out of your trunk. You sometimes can't align your body the way that you would like to spray water on to something, but getting as close as possible to facing it will usually activate it anyways. If it doesn't, just move your position slightly to the left or right and try again. Lastly, you may pick items up and carry them around on your back. If done with a pot, this can be used to throw the pot as a projectile at enemies, and with keys to place them into their appropriate locks. You can use Y to interact with everything else like talking to people, opening chests, or utilizing switches. 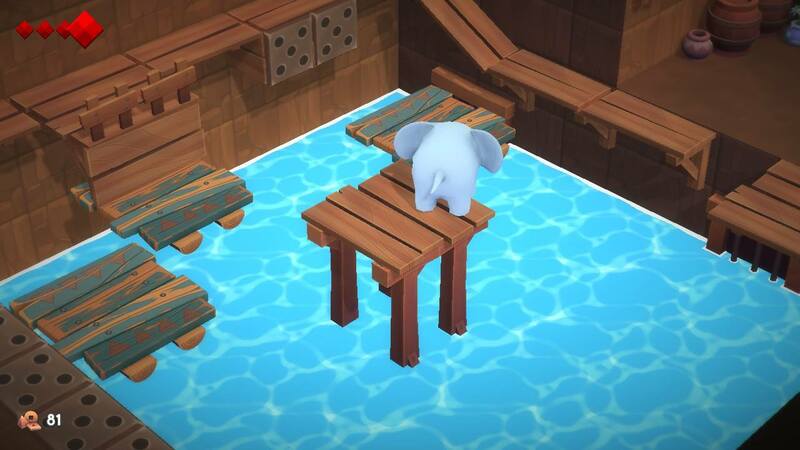 While it is a charming game with fun puzzles and endearing characters, there are a few minor drawbacks that need to be addressed here. When going from one room to another, it can sometimes be very jarring to be suddenly thrown into a white screen that loads when you hit the panel associated with the jump to another screen. Sometimes this panel happens before you expect it to (such as when it is placed at the beginning of a bridge instead of the end of the bridge next to the edge of the screen). Sometimes, you will be trying to complete a room's puzzle and accidentally end up back in the previous room. This will reset the room's puzzle to some degree, but thankfully doesn't reset it all. The controls also feel a little bit off when navigating platforms, and sometimes you will walk off one side of a platform and feel like you should fall, but don't, and other times where you don't think that you should fall, then do. It's really minor, and doesn't happen often, just make sure that you're very careful around corners and ledges. Yono and the Celestial Elephants is an incredibly fun game with a few minor flaws and an interestingly complex story hidden beneath cheerful visuals and upbeat music and sound effects. It isn't without it's flaws, but these are all easily adapted to and worked around.